What is the Sedona Philosophy? The Sedona Philosophy is a practice that connects people to one another and to nature. We emphasize that it is a practice because it is more about doing than believing. Just like a yoga practice builds strength and flexibility of the body, a philosophy practice builds strength and flexibility of the mind. Of course our minds and bodies are not really separate. We are not part body, part mind, and part spirit. We are an integrated whole. One complete self. The Sedona Philosophy practice honors the wholeness of the human condition. Sedona. The natural world is the best place to experience your complete self—mind, body, and soul. Sedona is one of the most beautiful places in this world, and it is famous for creating experiences of inspiration and transformation. The magnificent red rock landscapes invite us to notice both the world without and the world within. Philosophy. We take philosophy back to its roots, when friends talked about what the good life is and how to live it. Understanding our lives involves both inner and outer exploration. Kant said, “Two things inspire every increasing awe and wonder—the starry skies above, and the moral law within.” The starry skies above remind us of the grandeur of the universe. Morality reminds us that our thoughts and actions matter. Being in nature with others makes us feel big and small at the same time. It helps us make sense of the world, and our place in it. A friendly conversation is one of the most pleasant ways to explore meaning in the world and purpose in our lives. Sometimes we find answers, but more often we get insights. And we know that the insights that matter most are your own. Insights emerge through conversation—a dynamic and collaborative human exchange. Of course, what we learn depends on what we ask. That is, it depends on us. Or alternatively, what we learn very often depends on what we want to understand. The purpose of philosophy is to make us better people. We think simply being in nature does that, by inspiring qualities like creativity, courage, compassion, and kindness. A practice of dialogue does that too. The Sedona Philosophy is simply a practice of exploring your inner life outside. It allows people to discover wisdom together through dialogue. Also, it is fun! Sounds important and intriguing. Practical details please? I have bad knees/back but LOVE nature/how to manage? We’re so glad you asked that question! We customize outdoor immersion experiences and they can be as easygoing as you like. Sedona Philosophy accommodates many levels of physical activity, and Red Rock State Park offers ADA accessible facilities and trails. One paved trail has spectacular views of Cathedral Rock and takes you right to Oak Creek. The park also has flat, packed-sand trails along the creek for more mellow hiking. There are also benches and outdoor classrooms nestled throughout the park that provide ideal spots to be in the midst of nature while taking it easy. In short, we’ll make it a trip that is comfortable for you but still connects you with beautiful Sedona and, of course, the world of ideas. More generally, Sedona has many expansive overlooks easily accessible by vehicle that require little to no walking to get away from the crowds. 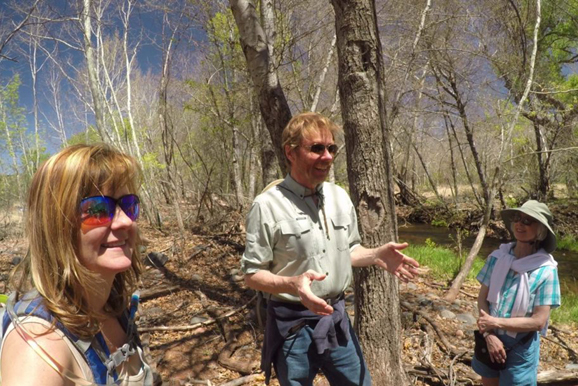 So whatever your ability or mobility, Sedona is a great place to connect with nature. Thanks again for your question and let us know if you have any more!